We are pleased to announce the AMS Special Session on Homotopy Type Theory, to be held on January 11, 2018 in San Diego, California, as part of the Joint Mathematics Meetings (to be held January 10 - 13). Further information about the Special Session, including a schedule and abstracts, can be found at: http://jointmathematicsmeetings.org/meetings/national/jmm2018/2197_program_ss14.html. Please note that the early registration deadline is December 20, 2017. 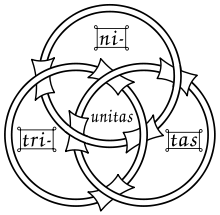 Perhaps for the emblem of Homotopical Trinitarianism you might choose the Borromean rings, which after all have been used to represent the Trinity. Interesting homotopy in the complement too. Sattler’s directed univalence axiom asserts that arrows in the universe are equivalent to spans of types.